Boston attracts visitors because of its abundant history, great restaurants and nightlife and lovely classic architecture—none of which means much to children. 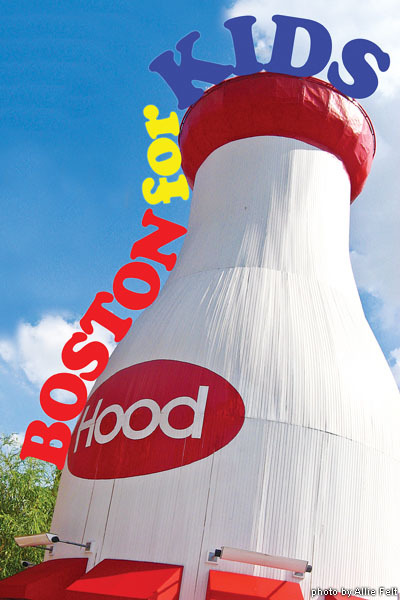 For kids, vacations should be about fun, and fortunately, Boston is a city brimming with just that. Take the heirs to your dominion to any of the 20 spots outlined below and watch their faces come aglow from something other than the reflection off their iPod or PSP. The Boston Children’s Museum (refer to museum listing) is the Hub’s premiere spot for young children, an edifice devoted to stimulating young people’s minds and creative impulses through hands-on exhibits. Highlights include the three-story tall New Balance Climb; the Kid Power exhibit, boasting activity-based stations like the Power Launch and the Lightspace Dance Floor; the special PlaySpace for children 3 years old and younger; and the Art Studio, in which children can explore their artistic side working with a variety of materials. Though kids don’t always muster up enthusiasm for school, Boston’s Museum of Science (refer to museum listing) provides a learning experience that will surely impress your junior Einstein. Highlights include interactive exhibits about everything from the natural world to electricity to outer space, as well as unbelievable 3-D, IMAX and planetarium shows. Hearing the teacher talk about history in school can’t compare to seeing it come to life before a child’s very eyes. That’s why youngsters get a kick out of visiting Plimoth Plantation about 40 miles south of Boston, where families can meet real members of the 12,000-year-old Wampanoag tribe; explore the recreation of a 1627 English village, made to resemble the settlement of the original Pilgrims; and climb aboard the Mayflower II, the replica of the immortal ship that brought settlers to Plymouth. Meanwhile, 60 miles west of Boston, children can get a sense of what rural New England life in the 18th and 19th centuries was like at the outdoor historical museum Old Sturbridge Village. Refer to excursion listings. Aspiring marine biologists will have a whale of a time at the New England Aquarium (refer to wildlife listing). Kids can view the enormous penguin exhibit, watch trained seals perform, see 675 species of marine life up close in the giant ocean tank, touch sea stars, hermit crabs and sea urchins in the Tide Pool, and even lay their hands on sleek yellow stingrays, Atlantic guitarfish and coral catsharks in the Aquarium’s newest attraction, the Sharks & Rays Touch Tank. Landlubbers, on the other hand, can safari with the family to the Franklin Park Zoo. Have a roaring good time with tigers and an African lion, explore the Savannah with ostriches and zebras, and go Down Under with kangaroos and kookaburras. The zoo also includes a tropical rainforest boasting a state-of-the-art gorilla enclosure, an extensive bird exhibit and a petting farm. Or head to the Stone Zoo in Stoneham. There, youngsters can meet snow leopards, jaguars, flamingos, river otters, meerkats, black bears and many other furry, feathered and scaly friends. Refer to wildlife listing. Historical walking tours can be interesting for grown-ups—but for little ones, “history” means last month, and little legs get tired. An exception to the rule is Boston by Little Feet (refer to tours and trails listing), an hour-long trek designed specifically for kids. The tour looks at Boston’s architecture and history from a child’s perspective, keeping your kids’ interest without leaving them exhausted. A tour bus plunging into water is not something you see everyday (ideally), but in Boston, Duck Boats—amphibious vehicles designed to travel on both land and water—are as common a sight as a bowl of clam chowder. The 80-minute Boston Duck Tours (refer to tours and trails listing), led by hilarious tour guides, cover Boston landmarks from the State House to Newbury Street, complete with a dip in the Charles River. Meanwhile, Super Duck Excursions (refer to tours and trails listing) go one step further, beginning at Charlestown Navy Yard and alternating between land and the waters of Boston Harbor, checking out sights like the USS Constitution and the historic North End. There’s only so much education and historical appreciation your kids are likely to be able to take. That’s why you need to work a few items onto the vacation agenda that are designed purely for fun—the kind of fun the whole family can enjoy together. The first of its kind in New England, the Puppet Showplace Theatre (refer to kids corner listing) uses this timeless artform to present two shows a week that will knock your sock (puppet)s off. Using marionettes, hand and shadow puppets, the PST’s dynamic productions range from classic fairy-tales to more cutting edge stories, including upcoming performances of Leopard Learns a Lesson (July 31 at 10:30 a.m. and 1 p.m.) and Sleeping Beauty (August 10 at 1 p.m.). The Balch Arena Theater on the Medford/Somerville campus of Tufts University is home to Magic Circle Theater (refer to kids corner listing), New England’s oldest theater by and for children. Each summer, Magic Circle presents full-length productions designed to introduce kids to the joy of theater, and this year’s no exception, with everyone’s favorite orphan, Annie, on July 29 & 30, The Phantom Tollbooth on July 31 and Humpty-Dumpty is Missing! on August 5 & 6. 5W!ts (refer to excursion listing)—Boston’s first interactive action-adventure attraction—engrosses visitors in Tomb, the story of a trip to a buried pharaoh’s final resting place. Your children (preferably ages 7 and up) are right in the middle of the action, thanks to state-of-the-art movie-like sets, special effects and a clever script. Even older kids and adults who fancy themselves as Indiana Jones-types will find Tomb an experience to treasure. In the evenings, Kings (refer to nightclubs listing) is one of the Back Bay’s prime playgrounds for grown-ups, who enjoy the state-of-the-art bowling lanes, billiards and cocktails. But during the day, families are welcome and kids will get a kick out of ten-pin bowling (if they can lift the balls!) in a flashy and funky environment. With kids, finding a restaurant that makes everybody happy can be the bane of one’s existence. The kids don’t want to go anyplace with vegetables and you don’t want all your meals to be eaten in the company of a grinning human-size rodent or under a golden arch. If you’re planning to take in the Children’s Museum, you’re just a few yards from a Boston dining institution—The Barking Crab (88 Sleeper St., 617-426-2722). Parents will love the fantastic variety of fresh seafood—from lobster to clams, scallops and, of course, crabs. Kids will enjoy eating under a giant tent overlooking the Fort Point Channel and sampling a kids’ menu that features fish and chips, mac & cheese and other favorites, all which come complete with an ice cream sundae. DJ’s at The Garden (222 Friend St., 617-723-3222) is built on the site of what was once Hooters—a place not recommended for kids. But DJ’s—home to a fabulous menu of upscale pub and comfort food—has become rugrat-friendly by establishing Family Night on Mondays. Beginning at 5:30 p.m., DJ’s shows popular kids’ movies on their hi-def TVs and kids eat free from a special family menu. Of course, most children’s favorite part of the meal is dessert, and nothing satisfies quite like ice cream. Boston has plenty of great spots for the cold stuff—head to Ben & Jerry’s (800 Boylston St., 617-266-0767) for fabulous ice cream and yogurt concoctions like Phish Food or Half Baked, or grab a Red Sox-inspired scoop of Cherry Ortiz at Beantown’s award-winning J.P. Licks (352 Newbury St., 617-236-1666).